It was the best of times, it was the worst of times — There’s a cliché for you, but I can’t think of a better way to describe my 2017. My brother Franke Ojeda was hit by a car and killed. He lived not far from me under humble circumstances. He struggled with mental illness most of his life, as I have. In Minnesota, he found a social safety net that kept him off the streets and in good health after many years as a vagabond elsewhere in the country and the world. He learned never to go off his meds, a lesson I’ve also learned the hard way, and found steady work at Home Depot. I didn’t spend enough time with him. Honestly, we were never close, but I should have made a greater effort. Now I can’t, and I’ll have to live with that. Even though I’m a newspaperman, it didn’t occur to me at the time that the two local dailies would care about this — but my Pioneer Press employer and its Star Tribune competitor did (thank you). 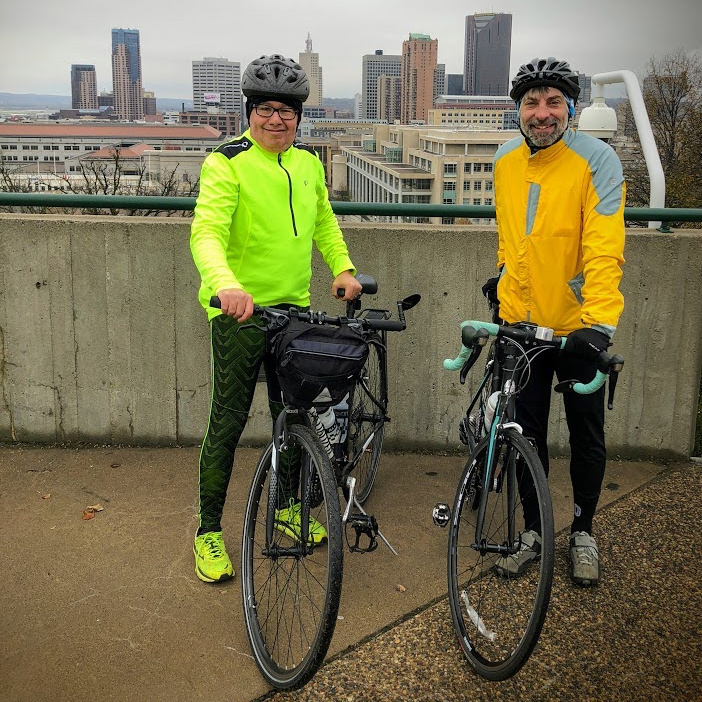 My year is ending on a spectacularly high note — with my body is the best shape it has ever been after I bicycled a mind-boggling 1,600 miles or so (a hefty percentage of those with my dear friend and neighbor Chris, shown with me above) on local streets and paved trails. This is how many miles I have bicycled this year, per Strava … and it might be closer to 1,600 because of app malfunctions that left some rides unlogged. Insane, regardless. In August, I wrote about my bicycling adventures at some length. My brother’s death has made me hyperconscious of my mortality and my need to take care better of myself in my advancing years. Bicycling is great for keeping my demons — including anxiety, clinical depression, grief, OCD and basic, everyday hyper-worrying — at bay. As I pedaled, I was often reminded of how fleeting our time on this Earth can be. Every now and then, I came upon a “ghost bike” — a painted-white and lovingly adorned bicycle meant as a memorial to a cyclist who perished while riding at or near that spot. I came across this colorfully adorned bicycle carcass on West River Parkway during my bicycle commute today. I now recognize “ghost” bikes. As my pal @christopher.hertel once explained to me, these are memorials to cyclists who were killed at or near those locations. “They serve to remind motorists to be careful, and to remind cyclists to be even more careful,” Chris said. On a ride today, I came across this oddly adorned bicycle carcass. I was puzzled until my friend @christopher.hertel explained it to me: "The white-painted bikes set up by the side of the road are placed there as a memorial to someone who was killed while riding at that location. There aren't very many of them around, thankfully. They serve to remind motorists to be careful, and to remind cyclists to be even more careful." I even wrote about ghost bikes for the Pioneer Press when a local bicyclist was killed by a hit-and-run driver. In his honor, dozens of cyclists staged a short memorial ride ending at his ghost bike. I came pretty close to having a ghost bike erected in my honor. Absentmindedly bicycling through a five-way intersection one summer day, I did not see a car approaching along one of the arteries. The driver screeched to a halt just in time and screamed at me. This shook me to my core, as nothing ever had before — It would have been my brother all over again. So my goals for 2018 are pretty simple: to stay fit, to stay safe, and to be grateful for a life that so far, for the most part, has given me the best of times.